Unsightly varicose veins are a result of poor circulation, often in the calf are of the leg. The valves responsible for preventing the backflow of blood start to fail and blood pools in the veins, resulting in enlarged veins. There are a couple of factors that will greatly increase your risk of developing varicose veins. As we age, our veins start to lose some of their elasticity, making it more difficult for them to push blood back towards the heart. They begin stretching out and allowing blood to pool. 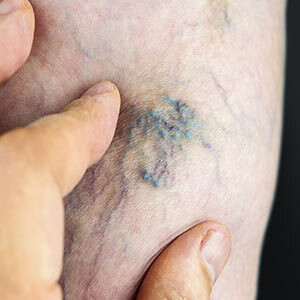 The deoxygenated blood that pools in these veins is blue in color, this is why varicose veins are a blue / purple color. Women are at an increased risk of developing varicose veins because it is a common side-effect of pregnancy. Pregnancy increases the total volume of blood in the body, it also decreases blood-flow from the legs. This is beneficial for the developing child, but it causes varicose veins to appear, especially in late pregnancy. Unlike varicose veins brought on from age, these are generally reversible and fix themselves after a few months post-birth. Anyone can develop varicose veins, but some factors can greatly enhance your risk. Age – As mentioned above, as we age our veins begin to lose elasticity and have a harder time sending blood back towards the heart. Gender – Women are more likely to get varicose veins because of pregnancy and hormonal changes. Certain female hormones actually relax vein walls, increasing the risk of blood back-flow. Genetics – Like most other health conditions, if you have a family history of varicose veins, you have an increased risk of developing them. Obesity – Overweight individuals run a greater risk of developing varicose veins due to the increased pressure put on the veins and inhibited cardiovascular function. Sitting – Sitting (or standing) for extended periods of time doesn’t allow your blood to flow properly. This can cause blood to pool and weaken the vein the walls. There are a few things you can do daily to help reduce your risk of varicose veins. Exercising regularly helps to improve blood flow, constricting the veins and pushing blood back towards the heart. Losing weight is important for the prevention of a myriad of health conditions, including varicose veins. When you are at a healthy weight, there is less pressure placed on your heart and veins, helping them perform their desired function and preventing blood from pooling. Get moving from time to time, avoid sitting or standing still for extended periods. After a long-day on your feet, try to elevate your legs to help circulation and prevent pooling. If prevention isn’t the name of the game anymore, there are a number of effective treatment options for varicose veins. Laser surgery is a popular option to treat small varicose veins and spider veins. There are no incisions, instead a powerful burst of light helps to close off smaller veins, causing them to fade away naturally. Vein stripping is a more invasive procedure, but can often be done outpatient. It involves a number of small incisions, removing the vein in small pieces. Sclerotherapy is a procedure where a scarring solution is injected into the veins. Often used for small to medium veins, they generally fade away after one or two treatments. There are a number of options for individuals to prevent and treat varicose veins. Many clinics specialize in these treatments, offering patients a wealth of information and a number of treatment options to best fit their individual needs. Varicose veins are more than just unsightly during swimsuit season, they can enhance your risk of developing blood clots. It is important to maintain healthy circulation throughout the body and treat existing varicose veins. Why Are Baby-Boomers the Unhealthiest Generation?